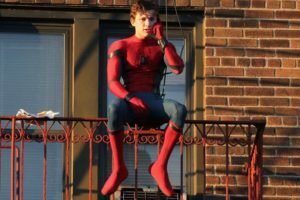 The first official trailer for Spider-Man: Homecoming was released last night and brought with it a lot of new information about the most recent, and so far best, incarnation of the web-crawler. This film has been a wild card for a lot of people considering how many hands are in the pot on this one. When Spider-Man first showed up as part of the Marvel Cinematic Universe in Civil War it was only because of an agreement was made between two competing studios, it was virtually unprecedented. But now the focus is entirely on Spider-Man and the stakes are much greater. If this film succeeds it could open the door for a lot more characters from other studios joining the MCU in mutually beneficial agreements. But let’s start with what we know. First, right from the start it’s clear that Robert Downey Jr.’s Tony Stark won’t be just be making a minor cameo appearance. By narrating a good chunk of the film it seems like Stark is mentoring his new prodigy in much the same way Nick Fury mentored him, eventually turning him into an Avenger. While that seems to be Stark’s long-term goal here it seems like he also wants to protect the young Peter Parker and stop him from making any mistakes he may have made. Parker is restless and wants to get into the action. He still does crime fighting at night but as soon as a much stronger villain arrives on the scene he wants to take him down on his own. Stark sees that’s a mistake and does his best to stop him. Whether or not that works remains to be seen. Let’s talk about the other elephant in the room, Michael Keaton as The Vulture. Now way back when Spider-Man 4 was still going to be a thing The Vulture was supposed to be the next major villain. But after the last reboot he remained on hold, until now. Typically drawn as a man in a giant vulture costume it was never really clear how the character would translate to the real world but the result looks fantastic. What’s even better is they got former Caped Crusader Michael Keaton to play the madman and he looks like he is having fun chewing the scenery. Another thing that is abundantly clear during this trailer is that despite being the third reboot of the character in just over a decade this will be a completely fresh interpretation. Tobey Maguire certainly set the standard but he always seemed a touch too old for the role. While Andrew Garfield did great when he was in costume it was always far too awkward watching him on screen as Peter Parker. But now that Tom Holland is allowed to play him as a real teenager it gives the character a lot more room to breathe. What little we saw of Holland is Captain America: Civil War proves he capable of holding his own and tying him into the larger universe, as an Avenger-in-waiting already gives the story a lot more power than the five other films that have come before it. Spider-Man: Homecoming opens in theaters on July 7,2017.